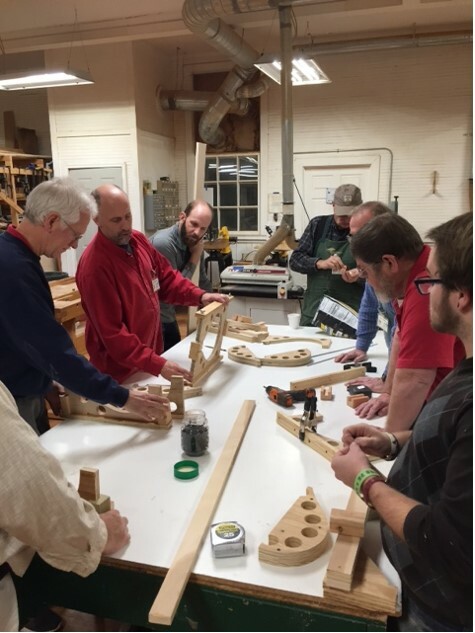 Luthier Group – Alabama Woodworkers Guild, Inc.
For this first session we will make the body template, the work board with side adjusters, and the shim that supports the top when it is clamped to the work board. 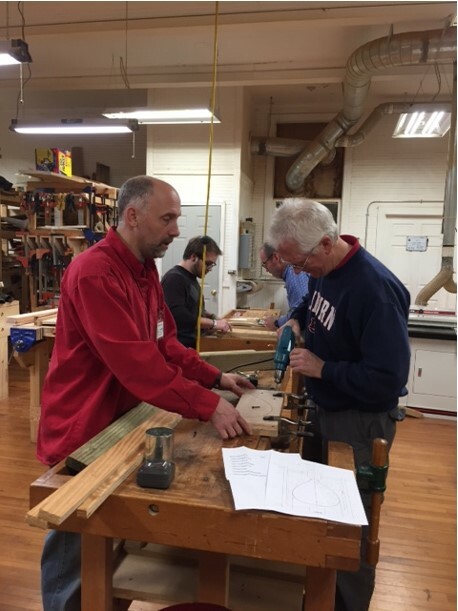 We’ll make a jig to aid in cutting the scarf joint for the neck on the table saw. Bring a pair of scissors to cut poster board for templates. Look at page 71 for a template for the headstock. You can use this or you can design your own. Just keep the dimensions within the bounds of the headstock. Look at this web site and pick out which style initial you want to inlay into the headstock. One of the 9/16” tall letters would look good. 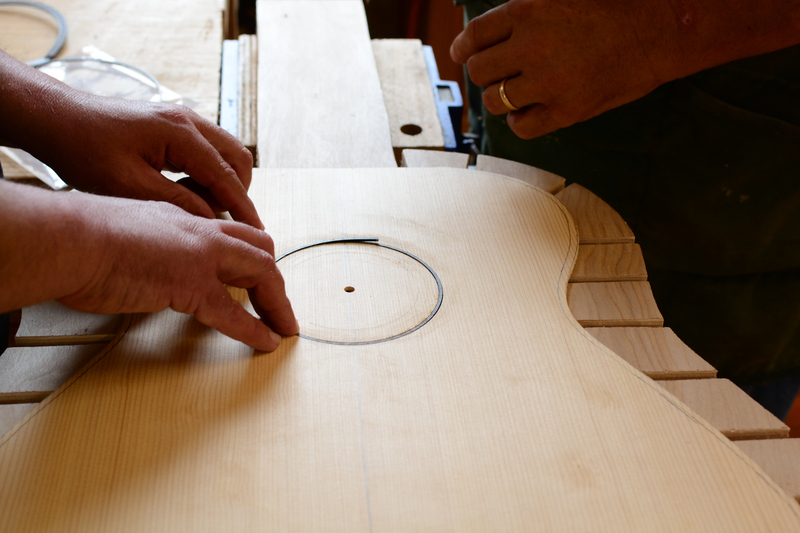 If you want something simple to inlay, look at the circles with an initial. They are $30.00 as opposed to $6.00 for a simple letter. I’ll need to get this ordered next week. If you have or can get an old inner tube that we can cut into strips to wrap odd shaped pieces that need to be clamped, bring them. You won’t need the workboard or the workboard shim this week. We’ll start with the neck (chapter 4). 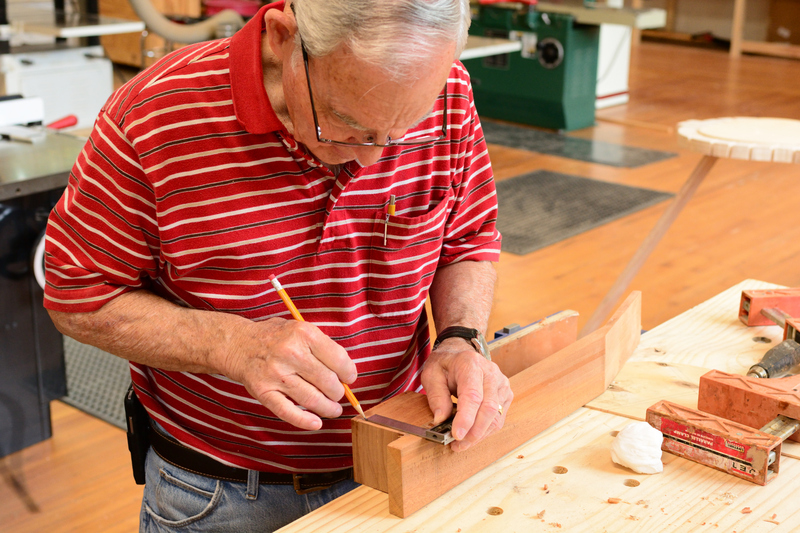 You have 2 mahogany boards that need to be dimensioned to 3” wide and ¾” thick. In step 2 in the book he cuts the scarf joint with a hand saw then makes the angled surfaces true in step 4. I make a simple fence set to 15 degrees to fit the miter slot in the table saw which gives me a surface that is very close to ready to glue. We’ll make that jig as one that everyone will use. 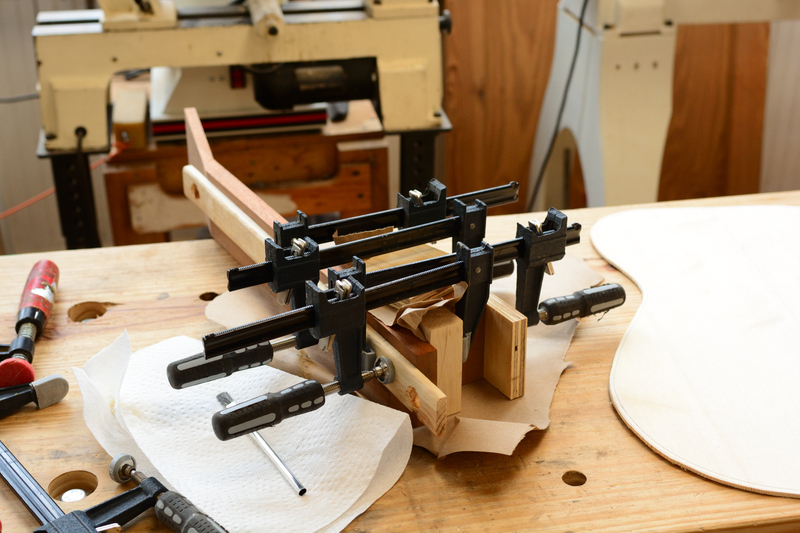 In step 4, I use the bandsaw to reduce the headstock thickness to ½”. 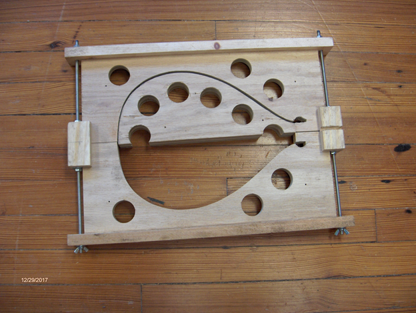 Bring the plywood (extra leg) to use in clamping and gluing as in the picture in 4-8. We’ll cut and glue the stacked heel block. We’ll skip making your own truss rod since we bought those. You have a piece of cocobolo to use as the headstock veneer. 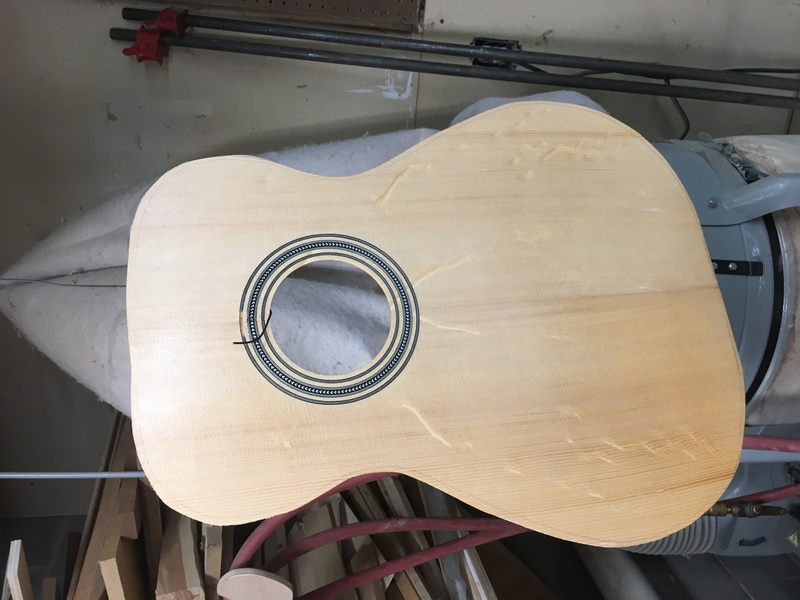 It will need to be dimensioned to around 1/16” thick and glued to the headstock (page 63) although you won’t glue it until you slot for the truss rod. Page 58 – if the neck blank has time for the glue to dry we’ll pick up with this procedure. 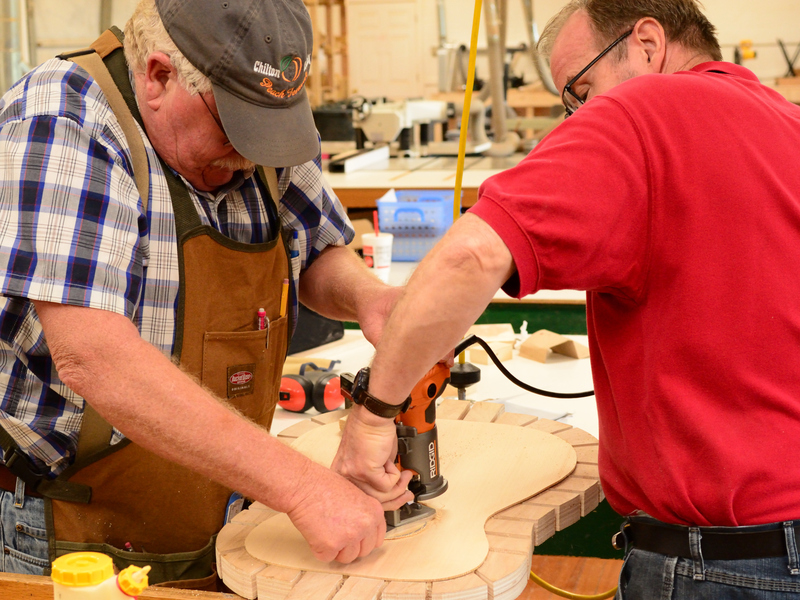 While the neck is drying we can begin to join the top, back and sides and glue the top and back bookmatched halves. It’s not likely that we’ll get to page 80, carving the heel but we’ll look at how this is done. 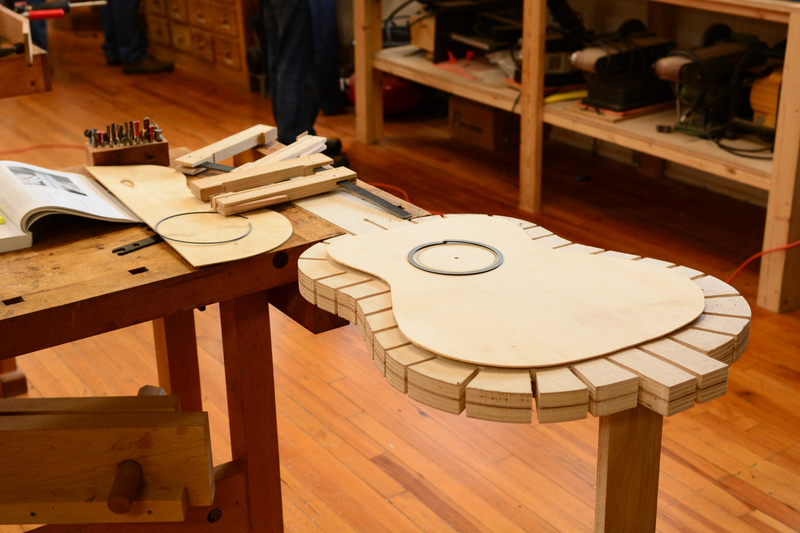 This week you can go ahead and glue the heel to the neck shaft. Refer to page 48 Step 8. The line you marked and sanded to on the peghead is the starting line for the measurements. If you don’t get the heel glued you can do that first thing. Install the rosette that you purchased (page 124 – 126 and page 133) We’ll match the channel to the purchased rosette. If we get all that done we’ll be doing good. Workboard but not the dowels. You’re going to need cam clamps to clamp the bracing to the top and back starting in week 4 Look at page 159 and you’ll see what I mean). We have 6 clamps at the WEC and I have some you can use. 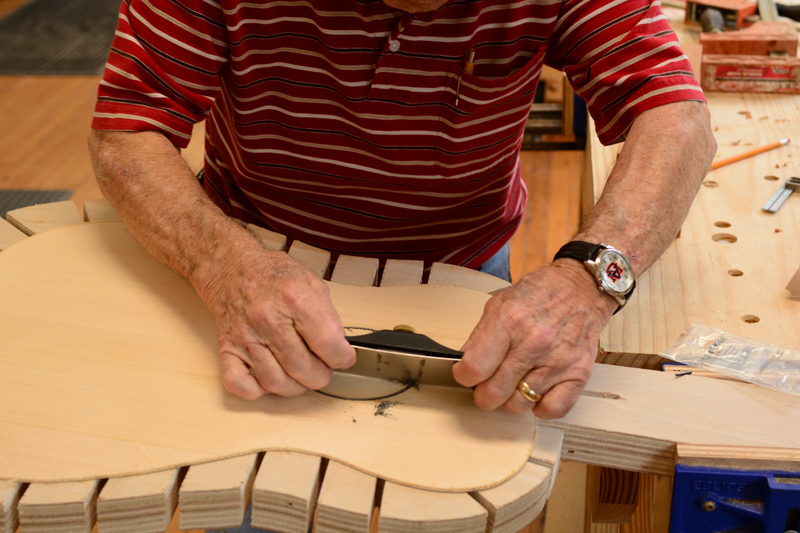 You may be able to borrow some from the folks who built mandolins. I’ve attached a plan if you want to build your own. A good sharp chisel will be needed to carve your braces. We have some at the WEC but it’s good to have your own and get used to using them. 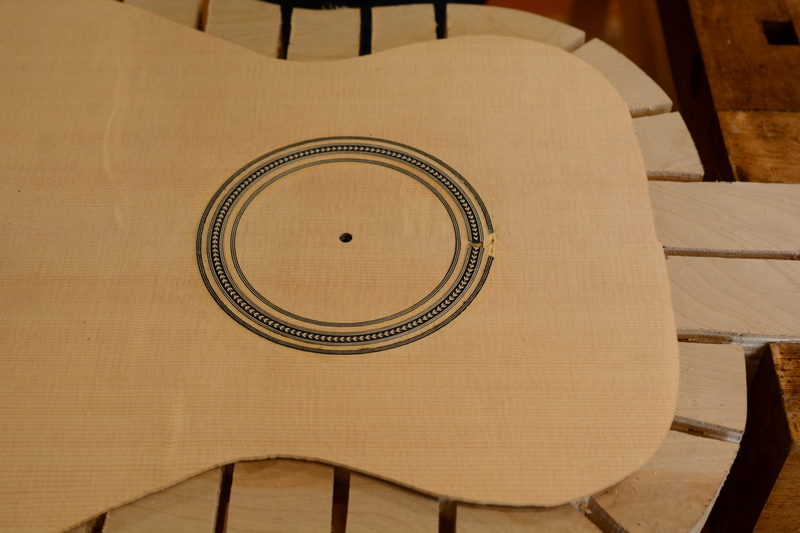 We’ll pick up from where we left off Monday and finish cutting the sound hole on the top. Go ahead and clean up the top and put a light coat of finish (lacquer, varnish, true oil, etc) to help protect it from damage as we keep working on it. 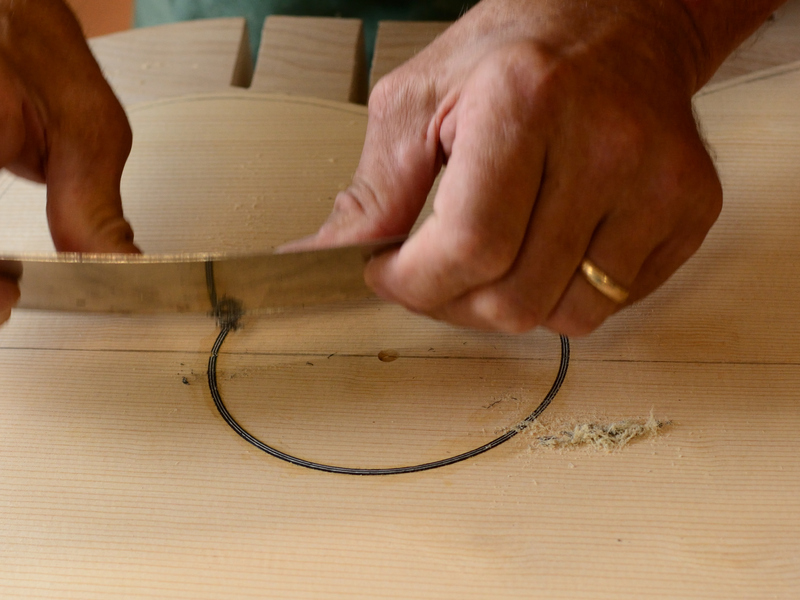 Page 74 – drilling the steel string headpiece. 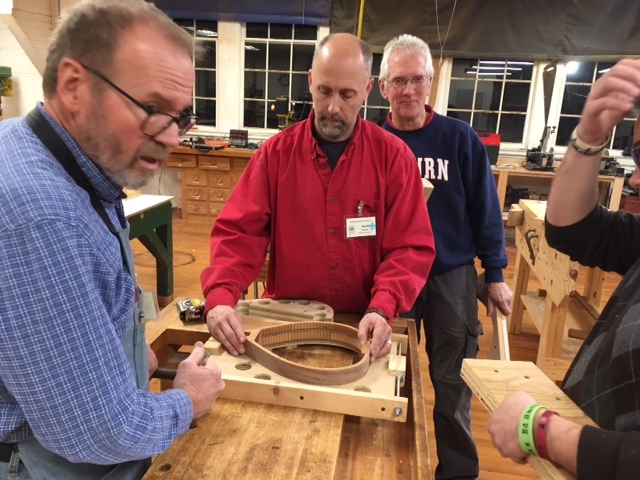 We’ll make a template for the top arching of 27’ radius and the back arching of 10’8” radius described in step 4 on page 150. 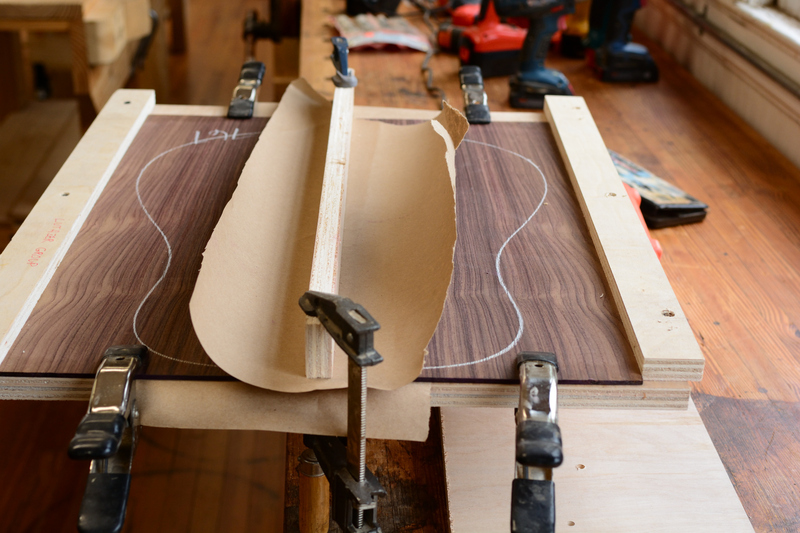 Plane the spline, you installed over the truss rod, flush with the neck shaft. Glue the headstock veneer to the headstock (page 64). We will trim it on the table saw as in the picture 4-28. 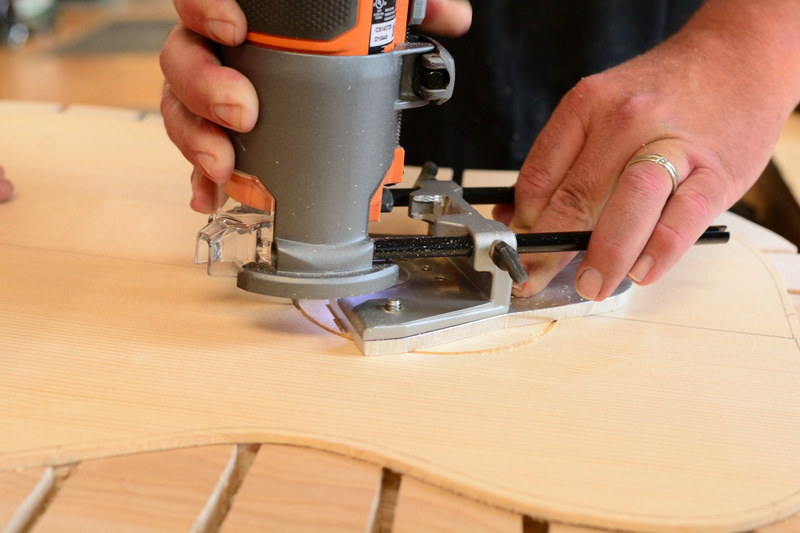 Draw the outline of your headstock on the back side of the headstock so you can bandsaw it with the headstock flat on the bandsaw table. Look at picture 4-39 on page 71 to see how the tuning machines need to be spaced but your pattern doesn’t have to look like this. 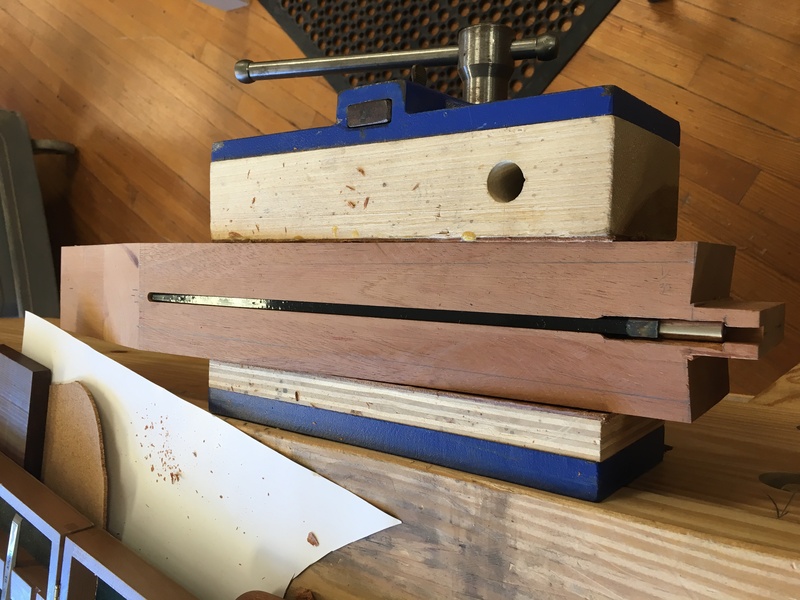 We should have time to bend sides for 2 guitars so we will prepare the sides (step 7 & 8 page 101) joint one edge of the sides, rip to just over 4” about 1/16” and sand your sides to .085” (page 104). You can sand your back to .10 (page 104). A note about sanding rosewood”: It is very oily and will gum the sander quickly so clean the sanding belt with each pass and take small passes (about 1/8 turn). Check frequently to be sure not to ruin a back or side. For those who finish carving their neck heel, you can start preparing your braces (page 147 – 152). A sanding block cut to an arch to match the arch of the top (27’ radius) and another to match the arch of the back (10’ 8”) (page 150) work great for arching the braces. I start with a piece of 2” wide and 20” long and cut the arch on the bandsaw then use double side tape to hold a strip of sandpaper. 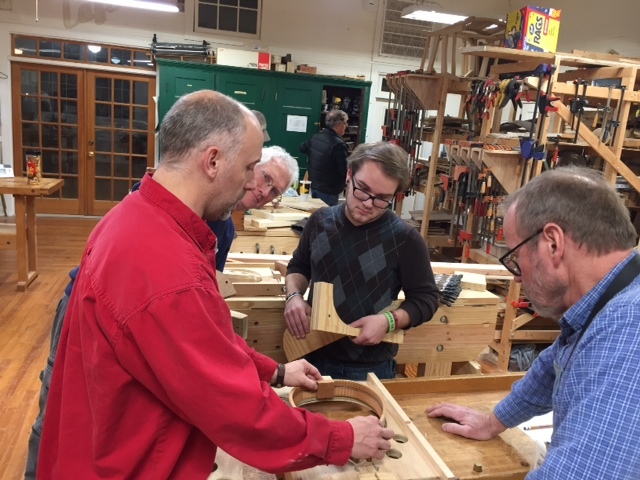 This week we’ll start bracing the top and adding kerfing to the sides. 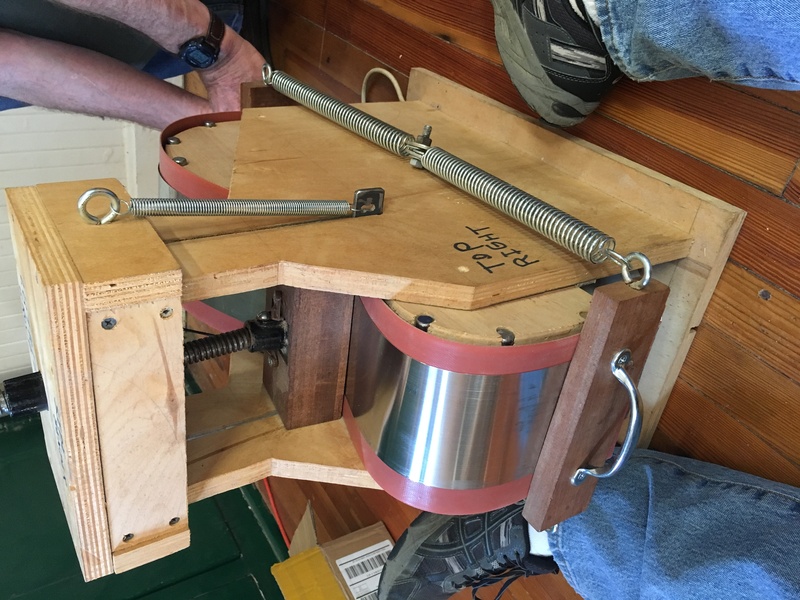 Clean up the heel with moderate grit sandpaper. You’ll sand to final later. Lightly draw the bracing on the inside of your top. You marked their location on your body template. Also refer to page 154. Material to make arch template (step 4 page 150) We have some 1/8” plywood we can use for this. 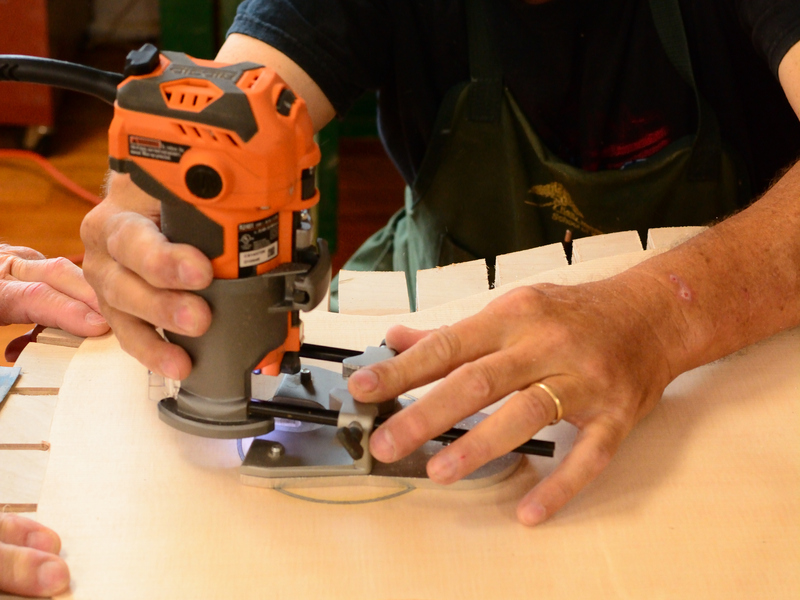 1” clamps to clamp the kerfing to the sides – clothespins reinforced with a rubber band will also work. You need around 25 per side. Check and trim the edge of the bridge patch so that the x brace will lie against it and on the line you drew. If you feel comfortable with shaping the flat braces go ahead. If you want to wait, you can shape them Monday. Finish gluing the kerfing to the top of the sides. Sand the arch on the remaining top braces. While glue is drying you can sand the back to .010” Be sure to scrape off the glue prior to sanding. Make a sanding board and sand the kerfing and sides getting them ready to glue to the top. Finish gluing and shaping all the top braces. Refer to the drawing on page 167 for the shapes. Note that the long lower face brace has a height of ½” at the tallest point and the short lower face brace has a height or 3/8” at its tallest point (see page 174). Cut 3 center seam diamonds from a piece of the left over top and glue and shape them . Their placement is on page 154. Their shape is in reference 7-35 on page 175. Make a headblock fixture like on page 212. Line up the hole in the fixture with the bottom hole in your headblock. Rather than clamping to the workboard, I drill a hold and use a bolt with a wing nut. 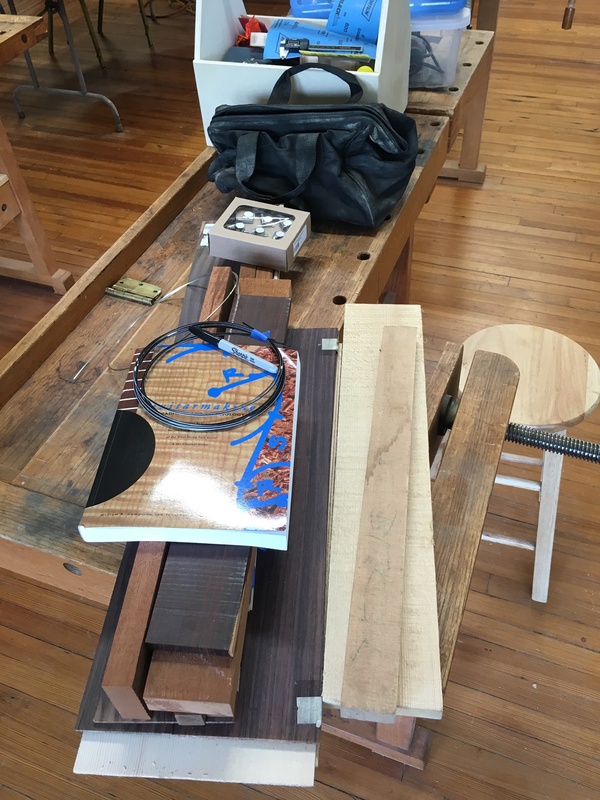 Make the fingerboard (starting on page 272) Watch out for what’s done for the classical guitar vs the steel string. Make bridge (page 343) I do this a little different than he does it. 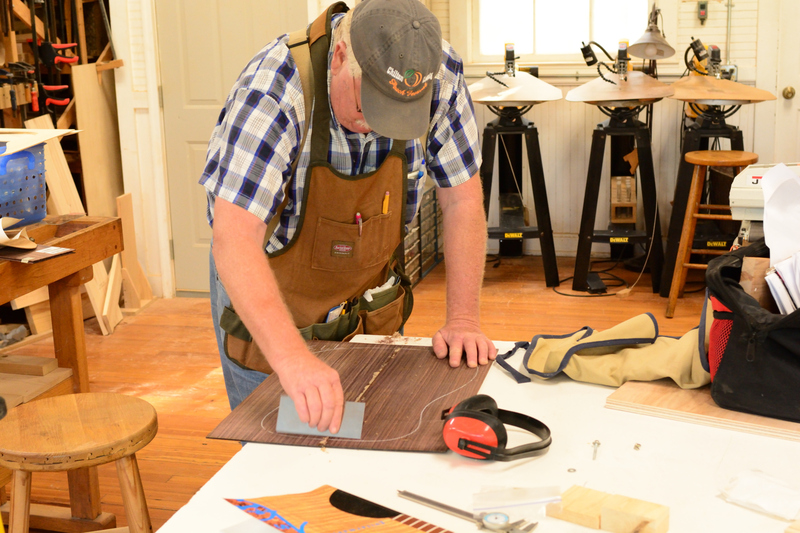 I’ll bring my trim router to cut the slot in the back for the centerseam and also the slot in the bridge for the saddle. We’re going to have some bottlenecks this week around tools that are being shared so be prepared for everyone to be working on separate things. I’d like to see everyone get their sides glued to the top if we can.